Dynasty Warriors spin-off gets new combat teaser. You may have spotted Berserk—the dark fantasy manga series that’s said to have inspired the likes of Dark Souls and Dragon's Dogma—is getting a game adaptation this year. 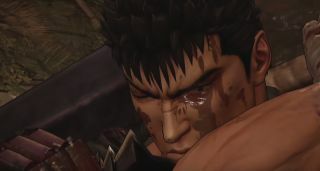 Arriving in the west at some point this Autumn/Fall, we’ve so far been treated to the smallest of glimpses regarding how protagonist Guts will tear up the battlefield. Pretty bloody, then. If you’d like to read more about the hows and whys of Guts’ actions above, an official English language website launched recently which offers insights into the game and surrounding series’ lore. Be warned, though, it drops some pretty heavy spoilers in doing so, and you may wish to avoid if you'd prefer to enter fresh. Berserk (which is for now a working title) is due to launch this Autumn/Fall.